This story was originally published Nov. 2, 1998. Tony Till held the crucifix in his arms, as he rode in the back of a pickup en route to the new St. Mary's Catholic Church on Friday. The crucifix, dating to 1873 and charred in several places, was one of the few relics salvaged and restored after fire destroyed the historic church five years ago. ``It was an honor to hold it,'' Till said. Till, Mike Huth and his wife, Amy, and others said they feel a sense of ownership in the new building. Together, they wiped dust off the pews, washed the windows of fingerprints and mounted the phoenix-like crucifix onto the new altar. The crucifix is home again, behind the new altar in the rebuilt, modern-Gothic church that opened last weekend for celebration of its first Mass at the corner of Jefferson Boulevard and Lafayette Street. ``I love the new building, '' said seven-year St. Mary's member Peter Massaro of Whitley County. ``It's a very holy building; you can sense God when sitting inside the chapel. ``It's been a long time coming,'' said Massaro, a steel engineer. He and scores of other faithful of St. Mary's inspected their new house of worship Saturday and Sunday. 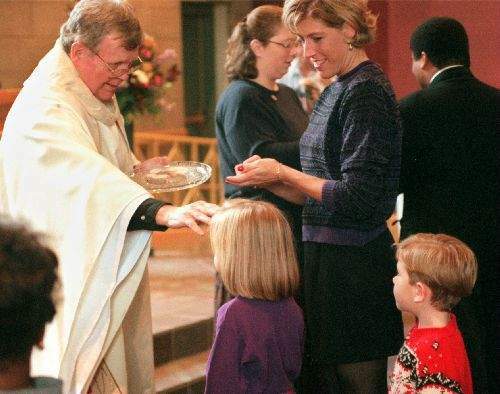 Since the Sept. 2, 1993, fire, they had worshipped at nearby St. Paul's Catholic Church. Parishioners sold shirts, pins, Christmas cards and ornaments with a logo displaying the old structure in the clouds above the new St. Mary's. ``Welcome to St. Mary's at St. Mary's,'' said Huth, president of the church's pastoral council, drawing applause from the 100 who shared the new sandalwood pews for the first Mass on Saturday. 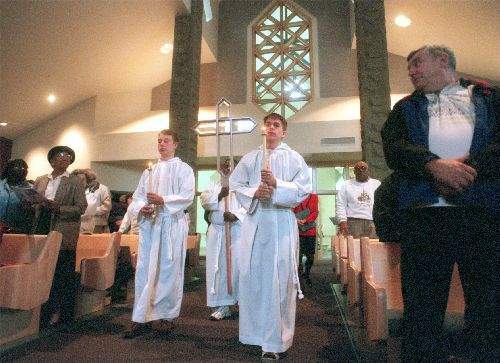 ``The padded pews are a nice change,'' said Diane Fisher, a church employee who was attending Mass with husband Roger. Windows everywhere light the main hallway and sanctuary naturally. Several recessed lights are placed in corners. The angled church seats about 275 worshippers. Stone columns support the high ceilings. Air-conditioning and purple wallpaper are among the features of the $3.5 million church that is twice as large as the old facility. A baptismal fountain is in the main hallway, as well as framed articles and photographs showing the rubble of the former building. Built in 1887, the red brick, Gothic-revival structure with its 238-foot main steeple was the third church for the congregation, founded in 1848 by 30 German families. When the smoke cleared after the fire, smoldering rubble covered what had been a 1,000-seat sanctuary lined with stout oak pews worn from generations of use. About all that remained of the church were its red brick walls - and its people. The people, the true church, persevered.